Stepping outside during the heat of summer often means getting a pleasant serenade from insects hoping to attract mates with their songs. Many insects make noise, but only a few rub their wings together to make the sound. Although most chirp with their wings at night, some make their music during the day. Balmy summer nights often are filled with the loud songs of crickets and katydids. Many cicadas make their songs during the day. Crickets make more pleasing sounds in lower tones, while katydids and cicadas tend to make higher, raspier sounds. Each species has its own rhythm and sound, although your ears might not be sensitive enough to distinguish them as you hear them all at once. Only the males sing; females find a song they like and use it to locate a mate. 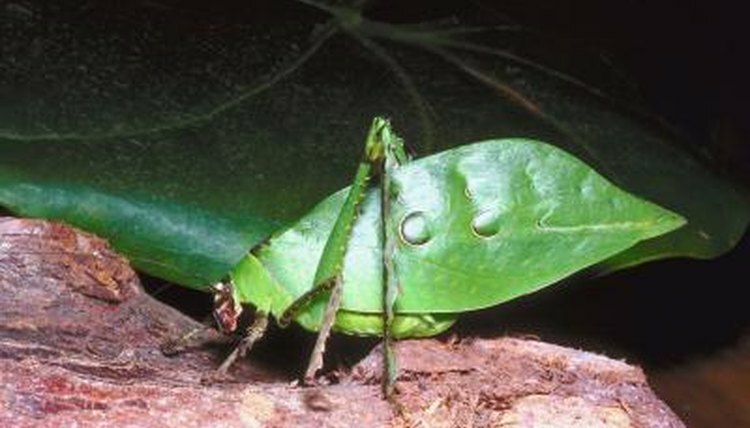 The wings of crickets, katydids and cicadas are specially designed for singing. They use only their forewings; one has ridges on the end, almost like a file, and the other has a scraper shape on the end. When the insect rubs the two edges together, he makes them sing. The insects are capable of amazingly fast scrapes -- field crickets can rub the scraper against 4,000 ridges per second, if you count going forward and backward along the ridged wing. You don't hear crickets, katydids and cicadas in the winter, and there's a reason for that -- they only chirp when the temperatures are high enough. Most sing between the temperatures of 55 and 100 degrees Fahrenheit. Although not a completely accurate way to tell the temperature outside, a simple calculation can give you an idea. Listen to the insects' chirps and count the number of chirps you hear in 15 seconds. Add 40 to that number, and it should be close to the actual temperature. Crickets, katydids and cicadas aren't the only insects who sing, nor are they the only ones to use their wings. They are, however, the only ones who rub their wings together to sing. Some grasshoppers and locusts rub their back legs against their wings to make noise, while others rub their back legs together to create a similar song. Songs of Insects: What is a "Singing Insect"?